For the past few years, I’ve been a member of the Board of Directors of Cleaning for a Reason, a non-profit foundation founded by my friend and business colleague, Debbie Sardone. The purpose of the organization is to provide free cleaning for women undergoing cancer treatment. Most people that hear the story immediately connect with it, as most of us have been touched by cancer in some way. Debbie owns a residential cleaning company in the Dallas area. 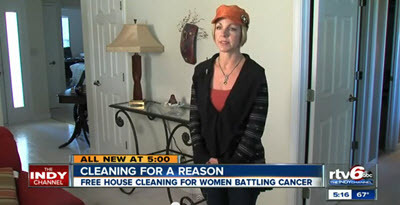 Several years ago a woman who had cancer called to see if someone could help clean her house. Unfortunately the woman couldn’t afford the service and was wondering if Debbie could donate the cleaning. Debbie’s first reaction was to say no, and immediately upon hanging up the phone, regretted it. She thought to herself, “Why can’t I clean her home for free? I own the business, and that is my decision.” So from that day on, Debbie made a decision that if any woman battling cancer reached out for help again, she would not be turned away. The phone call also gave her the idea to start Cleaning for a Reason, which has since grown to over 1000 participating maid services throughout the United States and Canada. As of this writing, the residential cleaning companies that participate in the program have provided more than 17,000 cleanings with a value of more than $4 million in donated cleanings. Setting aside our personal reasons for participating in a worthy cause, from a marketing perspective, our participation is called Cause Marketing. It is a type of marketing involving the cooperative efforts of a for-profit business and a non-profit organization for mutual benefit. It’s also a unique way to differentiate your business from all the other similar businesses in your marketplace. Dawn Dishwashing Liquid uses pictures of animals they’ve saved from oil spills. For every bottle purchased, Dawn contributes $1.00 to aid wildlife preservation. Cadbury Chocolate partnered with Save the Children to raise funds for Save the Children and other focused community programs, which benefited the cause and Cadbury’s corporate image. Yoplait Yogurt’s “Save Lids to Save Lives” campaign in support of the Susan G. Komen Foundation for the Cure of Breast Cancer. The company packaged specific products with a pink lid that consumers turned in, and Yoplait donated $.10 for each lid. Cause marketing is a valid business strategy. When you select a potential non-profit partner that has a natural affinity with your for-profit business, the result can be more media exposure, stronger public relations, plus additional revenue. And these three will more than likely serve both partners. Large corporations use cause marketing very successfully. Small businesses can learn a lot from them, and work to duplicate what makes sense for your business in order to reap greater profitability. How do you differentiate your business from your competition? Competing for price is a no-win situation. Providing a guarantee is commonly done by many. Saying your quality is top notch is all too often touted. None of these claims truly stand out. Cause marketing can create that ultimate differentiation to make your company and the cause you foster memorable. In Debbie’s case, her primary business is Buckets & Bows Maid Service. Her heartfelt cause is helping women with cancer through her company’s participation in Cleaning for a Reason. By leveraging the fact that her company provides free cleaning for women undergoing cancer treatment when marketing her business, it makes her business memorable. And the fact that Debbie is the founder of this nationwide foundation, results in even more publicity for her cleaning business. Another important aspect of cause marketing is to do more than just give money. As business people, we frequently become so focused on business essentials and challenges, we forget all about doing something nice for someone else or just doing good for the community. Adding cause marketing to your business mix allows you and your employees the opportunity to “do good”. In fact, in the case of Cleaning for a Reason, the cleaning technicians of the participating companies love to do the cleaning for women with cancer so much that they vie to be at the top of the list to do these cleanings. They feel a genuine connection to these women and they feel as if they’ve served a higher purpose through their participation in the cause. When companies have a passion for a cause, and ensure their participation is mutually beneficial to both entities, then the result is often more loyal customers and more loyal employees. And the bonus is more attention for your business due to the social impact you’re making in your community. In Part 2, I’ll discuss how to use public relations to increase visibility for your business and your cause.